Nearly 80 percent of our student body participates in Extended Day. 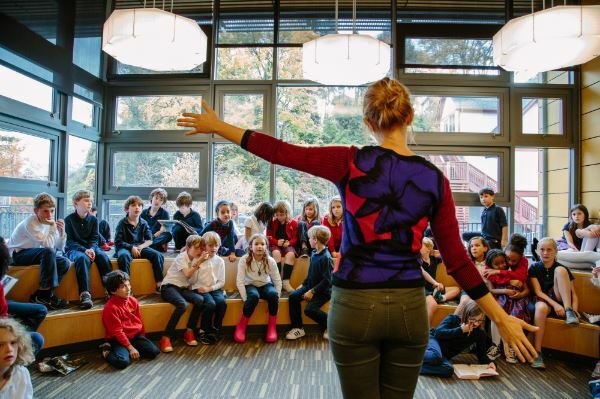 For all ages and grades, we offer active, engaging, and enriching programs that continue to reinforce the lessons our students learn during the school day – both before and after class. Extended Day opens at 7:00 am and operates until the start of the school day at 8:15 am. It reopens at 3:00 pm and runs until 6:00 pm. On certain non-school days and breaks, Extended Day operates full- and half-day programs and camps. Families pay a daily flat fee for Before and After School Extended Day. Before school is $7 per day. After school is $18.25 per day. For families receiving financial aid, charges are discounted. A maximum of one club charge per session is also discounted. Through a balance of structured activities and unstructured playtime, Epiphany School students interact with their peers and other students across grade levels. Children have the freedom to move around and explore both indoor and outdoor settings. We are open to and responsive to family requests. Offerings include access to the Library, a rotating Craft-of-the-Day project, guided study in our Homework Club with alumni tutors, and supervised unstructured play on our turf-covered Commons, on our game courts in the Cage, and in our Chips play space. For information about our care program during school breaks and over the summer, see School Break Camps below. CATERING TO OUR STUDENTS’ UNIQUE, DIVERSE, AND VARIED INTERESTS. Because of our diverse population, Epiphany School student clubs are forever evolving to meet the needs of our families. There are three club sessions throughout the year: Fall, Winter, and Spring. Offerings are updated based on demand and interests. Sample clubs from prior years include LEGO engineering, Chess, Martial Arts, Knitting, Yoga, Mandarin, and Spanish. Ideas for school clubs come from our students themselves, from their parents, from teachers and staff, and from community members and vendors. After-school clubs meet during Extended Day and include enrichment courses taught by contractors, craft and game clubs led by staff and faculty, and experiential learning opportunities that are as hands-on as classroom activities. PROVIDING CREATIVE, SAFE, AND ACTIVE MULTI-AGE ADVENTURES. Epiphany School offers week-long programs during Summer, Mid-Winter, and Spring Breaks. Camps are available to all grade levels for currently enrolled Epiphany School students and operate under the same guiding principles as our school-year program. Just as always at Epiphany School, we create an environment that challenges students to be curious as they learn to be courageous and confident. Our talented staff cultivates an inclusive community that encourages empathy through respect of differences; and creates activities that build integrity, responsibility, resilience, and resourcefulness. Learn more about Epiphany School Summer Camp here!